However, this was not to last. On 11 February 1985, while Salyut 7 was in orbit on autopilot awaiting its next crew, mission control (TsUP) noticed something was off. Station telemetry reported that there had been a surge of current in the electrical system, which led to the tripping of overcurrent protection and the shutdown of the primary radio transmitter circuits. The backup radio transmitters had been automatically activated, and as such there was no immediate threat to the station. Mission controllers, very tired now that the end of their 24-hour shift was approaching, made a note to call specialists from the design bureaus for the radio and electrical systems. The specialists would analyze the situation, and produce a report and recommendation, but for now the station was fine, and the next shift was ready to come on duty. There was only one other option: fly a repair crew to the station to fix it from the inside, manually. But this could easily become yet another failure. The standard procedures for docking to a space station were entirely automated and relied heavily on information from the station itself about its precise orbital and spatial coordinates. During those rare occurrences when the automated system failed and a manual approach was required, the failures were all within several hundred meters of the station. How does one approach a silent space station? The lack of communication presented another problem: there was no way to know the status of the onboard systems. While the station was designed to fly autonomously, the automated systems could only cope with so many failures before human intervention would be required. The station could be fine, or there could be a fire on the station, or it could be struck by space debris and depressurize, etc. ; there would be no way to know. If there was a meeting in which top managers discussed and weighed all the options, the notes of that meeting have not been made public. What *is* known, however, is that the Soviets decided to attempt a repair mission. This would mean rewriting the book on docking procedures from scratch and hoping that nothing else went wrong aboard the station while communication was down, because if something else did go wrong, the repair crew might not be able to handle it. It was a bold move. The first order of business for the repair mission was figuring out how they would get to the station. For an approach to the station under better circumstances, the Soyuz (a 3-seat ship used to ferry cosmonauts to and from space stations) would receive information from the station via mission control (TsUP) as soon as it reached orbit, long before the station would be visible to the crew. This communication would contain information about the orbit of the space station so that the visiting craft could plot a rendezvous orbit. Once the two craft were 20-25km apart, a direct line of communication would be established between the station and the ship, and the automated system would bring the two craft together and complete the docking. Although all Soyuz pilots were trained to perform a manual docking, it was rare for the automated system to fail. 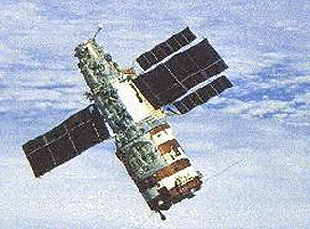 Of those rare failures, the worst was in June 1982 on Soyuz T-6 when a computer failure stopped the automated docking process 900m away from the station. Vladimir Dzhanibekov immediately took over controls and successfully docked his Soyuz with Salyut 7 a full 14 minutes ahead of schedule . Naturally, Dzhanibekov was the leading candidate to pilot any proposed mission to rescue Salyut 7. 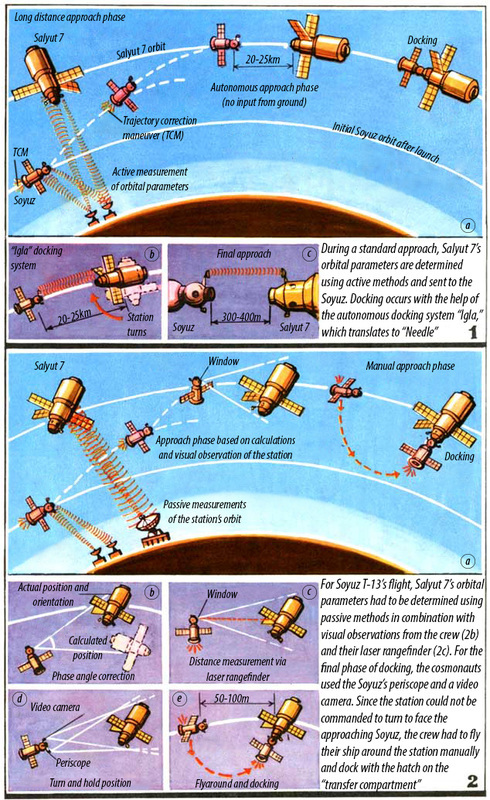 An entirely new set of docking techniques had to be developed, and this was done under a project titled “docking with a non-cooperative object.”  The station’s orbit would be measured using ground-based radar, and this information would be communicated to the Soyuz, which would then plot a rendezvous course. The goal was to get the ship within 5km of the station, from which point it was deemed a manual docking was technically possible. The conclusion of those responsible for developing these new techniques were that the odds of mission success were 70-80%, after proper modifications to the Soyuz. , The Soviet government accepted the risk, deeming the station too valuable to simply let it fall from orbit uncontrolled. Who would fly the mission? When it came to selecting a flight crew, two things were very important. First of all, the pilot should have had experience performing a manual docking in orbit, not just in simulators, and secondly, the flight engineer would need to be very familiar with Salyut 7’s systems. Only 3 cosmonauts had completed a manual docking in orbit. Leonid Kizim, Yuri Malyshev, and Vladimir Dzhanibekov. Kizim had only recently returned from a long duration mission to Salyut 7, and was still undergoing rehabilitation from his spaceflight, which ruled him out as a possible candidate. Malyshev had limited spaceflight experience, and had not trained for Extra-Vehicular Activity (EVA, or spacewalk), which would be required later in the mission to augment the station’s solar panels, provided the rehabilitation of the space station went well. On June 6, 1985, nearly 4 months after contact with the station had been lost, Soyuz T-13 launched with Vladimir Dzhanibekov as commander and Victor Savinikh as flight engineer. , After two days of flight, the station came into view. As they approached the station, live video from their ship was being transmitted to ground controllers. Below is one of the images controllers saw. The crew continued their approach. Silently, slowly, the crew’s Soyuz flew towards the forward docking port of the station. The successful docking to the station was a great victory, and demonstrated for the first time in history that it was possible to rendezvous and dock with virtually any object in space, but it was early to celebrate. The crew received no acknowledgement, either electrical or physical, from the station of their docking. One of the main fears about the mission, that something else would go seriously wrong while the station was out of contact, was quickly becoming a reality. Earth: "Open the [ship-side] hatch"
Savinikh: "We got it open"
Earth: "Was it tough? What's the temperature of the [station-side] hatch?" Dzhanibekov: "The [station-side] hatch is sweaty [from condensation], we can't see anything else"
Earth: "Copy that. Carefully rotate the cap* 1-2 turns and then quickly move back into the habitation module. Be prepared to close the ship-side hatch. Volodya [Dzhanibekov], you open it just one turn and listen if it's hissing or not"
Dzhanibekov: "Got it. It's hissing a little, not too strongly"
Earth: "Well open it a little bit more then"
Dzhanibekov: "Done. It's really hissing, the pressure is equalizing"
Earth: "Close the [ship-side] hatch"
Earth: "Let's wait and see for say, 3 minutes, and then we'll move forward"
Dzhanibekov: "No change in pressure... it's starting to equalize. Really really slowly"
Earth: "Well, we still have a long flight ahead of us. And so no reason to rush!" Dzhanibekov: "Pressure is at 700mm. The drop was about 20-25mm. We'll open the [ship-side] hatch now. Open"
Earth: "Is the cap hissing? Jiggle it. Maybe it's got a bit more to go, and you can keep equalizing the pressure with it." Dzhanibekov: "We'll figure this problem out quickly. Ah, that familiar smell of home... OK I'm opening the cap even more. There, now we're talking"
Earth: "Is there a cross-flow?" Earth: "If you're ready to open the station-side hatch, you can go ahead"
Dzhanibekov: "We're ready, opening the hatch. Op-a, it's open"
Earth: "What do you see?" Dzhanibekov: "No, I mean I've got the lock open. Now I'm trying to open the hatch. Entering"
Earth: "First impressions? What's the temperature like?" At this point the cosmonauts started to grasp their predicament. The station’s electrical system was out of power and thermal control systems had been shut down for some time. This meant that not only were critical provisions like water frozen, all of the station’s systems had been exposed to temperatures they were never designed to operate under. It wasn't even really clear if it was safe for the crew to be on board. Earth: "It is really cold?" Earth: "Well then you should close the hatch to the habitation module a little bit, not all the way." Dzhanibekov: "No unusual smells, cold though"
Earth: "You should take the covers off the portholes"
Dzhanibekov: "We're taking them off as we go"
Earth: "On the hatch you just opened, you need to close the cap all the way"
Dzhanibekov: "We'll do it immediately"
Earth: "Volodya, what do you think, is it minus or plus[centigrade]?" Dzhanibekov: "Plus, just a little. Maybe +5"
Earth: "Try turning on the light"
Savinikh: "We're trying to turn on the light now. Command issued. No reaction, not even one little diode. If only something would light up..."
Earth: "If it's cold, dress up... take your time to get acclimated and slowly get to work. And everybody needs to eat. Congratulations on entering! Shortly thereafter, their orbit took them out of range of ground stations and therefore out of contact with mission control. This was a normal occurance back then; today relay satellites in high altitude orbits ensure constant communication with the International Space Station (ISS). Later in the day, the crew re-established communication with mission control as they prepared to analyze the air inside the work compartment by allowing some of it into indicator tubes. These tubes would indicate the presence of ammonia, carbon dioxide, carbon monoxide, or other gases that might indicate that there had been a fire aboard the station, or something like that. Earth: "What's the temperature like?" Savinikh: "3-4 degrees. Nice and chilly." Earth: "What's the pressure in the compartment?" Savinikh: "693 mm. Commencing gas analysis." Earth: "Please, when you're performing the analysis, hold the indicators in your hand for a little bit to warm them up. It'll increase their accuracy. Are you guys working with flashlights?" Earth: "We're planning to open the hatch [to the work section] on the next orbit. And on that I think we'll end for the day. You guys are tired enough. We'll pick up in the morning." The indicator tubes indicated the atmosphere on the station was normal, so the crew equalized the pressure between the compartments in a similar manner to what they had done before with the outside hatch of the airlock. Mission control advised them to put on their gas masks, just in case, and open the hatch. Now that the crew and mission control were aware of their predicament, they had to do something about it. The crew woke the next morning to instructions from the ground: first examine “Rodnik,” the potable water storage system, and see if the water there was frozen. They were also given limitations on their ability to work. Due to the lack of ventilation in the frozen station, a cosmonaut’s exhalations would build up around him, and he could easily succumb to carbon dioxide poisoning. Therefore the ground limited the crew to working in the station one at a time, with the one in the ship keeping an eye on the one in the station for signs of CO2 poisoning. Dzhanibekov went first. Later, Savinikh took his place, and tried to pump air either in or out of the air bladders of the system. Instead, ground controllers came up with a complex procedure for the crew to implement. Firstly, they would test the station’s batteries to see how many of them could accept a charge. Much to their happiness, 6 of the 8 batteries were deemed salvageable. Next, the crew prepared cables to connect the batteries directly to the solar panels. All told, they had to put together 16 cables, connecting the leads of the cables by their bare hands in the cold of the station. With the cables connected, the crew would clamber into the Soyuz and use its attitude control engines to re-orient the station so that its solar panels would face sunlight. All the while they had been working, they really didn’t know if they would be staying, or if they would run out of water first. They tried not to talk about it, focusing instead on their work. After having re-orientated the station and waiting for about a day, 5 batteries had been charged. The crew disconnected them from their rudimentary charging system, and connected them to the station’s electrical grid. They turned on the lights, and much to their relief, the lights came on. On June 12, flight day 6, the crew began replacing the fried communications system and testing the water coming out of the slowly-thawing Rodnik system for contaminants. On June 13, flight day 7, the crew continued their work with the communications system, and by afternoon Moscow time, ground control had re-established a link with the station. They also tested the automatic docking system, knowing that if the test failed they would have to go home. The station needed supplies, and they could only be brought in large enough quantities by cargo ships which could not be controlled manually like the Soyuz. But thankfully, the test was successful, and the cosmonauts continued their mission. Dzhanibekov stayed on the station for a total of 110 days, and helped to discover that it was a faulty sensor within the automatic charging system that led to the myriad of problems his crewmate and him had faced. The sensor had erroneously reported the batteries as being fully charged, and instructed the system to stop charging to prevent overcharge, but never reset even when the batteries discharged. Had communications not been damaged, ground controllers could have intervened. Dzhanibekov returned home on Soyuz T-13 with Georgi Grechko, who had flown up to the station with Vladimir Vasyutin and Alexander Volkov on Soyuz T-14 in September of 1985. Vasyutin, Volvkov, and Savinikh remained on board for a long term expedition which was cut short in November as Vasyutin fell ill, forcing an emergency return to Earth. On February 19, 1986, the core block of Salyut 7’s successor station, Mir, was launched. 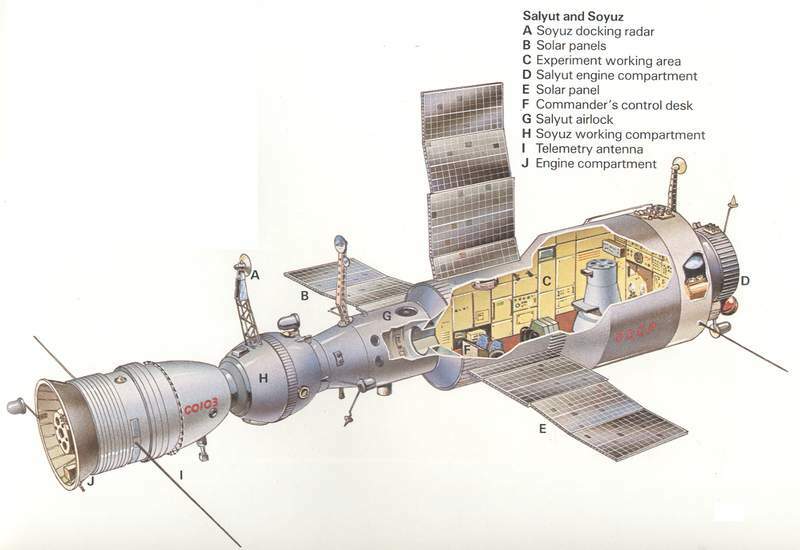 Although its replacement was in orbit, Salyut 7’s role in the Soviet space station program was not quite finished. The first crew to launch to Mir did something unprecedented. 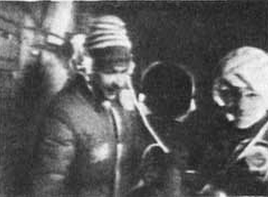 After arriving at Mir and performing initial operations to bring the new station online, they boarded their Soyuz and flew to Salyut 7, the first and, to date, only time in history a station-to-station crew transfer had taken place. They completed the work left behind by the Soyuz T-14 crew, after which they returned to Mir before eventually returning to Earth. Although the station itself is gone, its legacy of triumph over adversity remains. Salyut 7 experienced some of the most serious problems of any station in the Salyut series, but while earlier stations were lost, the skill and determination of the designers, engineers, ground controllers, and cosmonauts of Salyut 7 kept the station flying. That spirit lives on today in the International Space Station, which has flown continuously for over 15 years. It too experiences systems failures, coolant leaks, other problems, but like their predecessors who worked on Salyut 7, the designers, engineers, ground controllers, cosmonauts, and astronauts exhibit that same determination to keep flying. "Soyuz T-13." Wikipedia. Wikimedia Foundation, 21 Apr. 2014. Web. <http://en.wikipedia.org/wiki/Soyuz_T-13>. Mcquiston, John. "Salyut 7, Soviet Station in Space, Falls to Earth After 9-Year Orbit." The New York Times. The New York Times, 6 Feb. 1991. Web. <http://www.nytimes.com/1991/02/07/world/salyut-7-soviet-station-in-space-falls-to-earth-after-9-year-orbit.html>. Canby, Thomas Y. "Are the Soviets Ahead in Space?" National Geographic 170.4 (1986): 420-59. Print. * - in Russian. Translations from these sources were performed by the author.